It’s time for Christmas gift buying, gift wrapping and gift tagging. Don’t you just love Christmas time? To me, wrapping presents is fun and pretty relaxing, but I’ll admit that one of my least favorite parts of wrapping is tagging my wrapped gifts. Am I the only one? I always make sure to buy gift tags at the after-Christmas sales so I have plenty on hand, but the things make me crazy. The plain ones are often, well…boring and the beautiful foiled ones always seem to repel ink. Seriously, someone should test those things out before they sell them as gift tags. It seems that if I can find a pen that actually writes on them, the ink always smears when I try to stick it on the package. Urrgggh. First thing that I did was to cut simple tag shapes, pairing two for each tag. I made sure that the plain side faced out as I cut them, because really, who really wants a picture of a tri tip sandwich on their gift tag. As you can see, I used a tiny loop of tape to hold each side of the fabric/cardboard in place, making sure to line the cardboard up well. Easy. 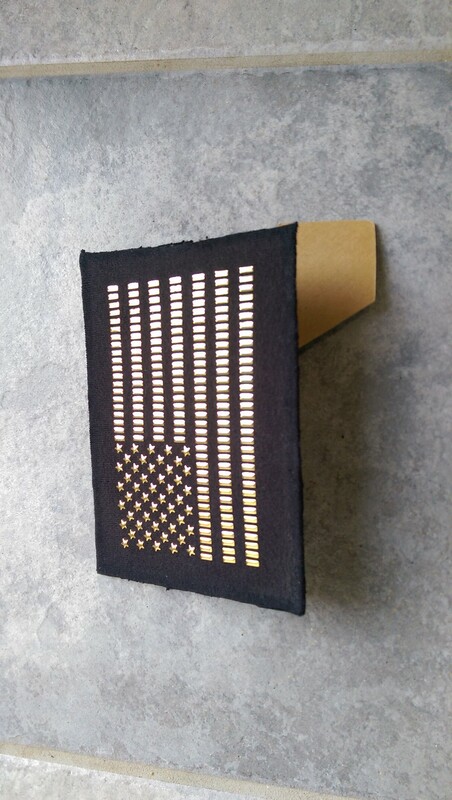 Next, I took it to my sewing machine and used a long, straight stitch around the whole thing. I made sure to start at the center-top of the tag and overlapped a few stitches to secure the thread, knowing that the ribbon would hide the cut threads. 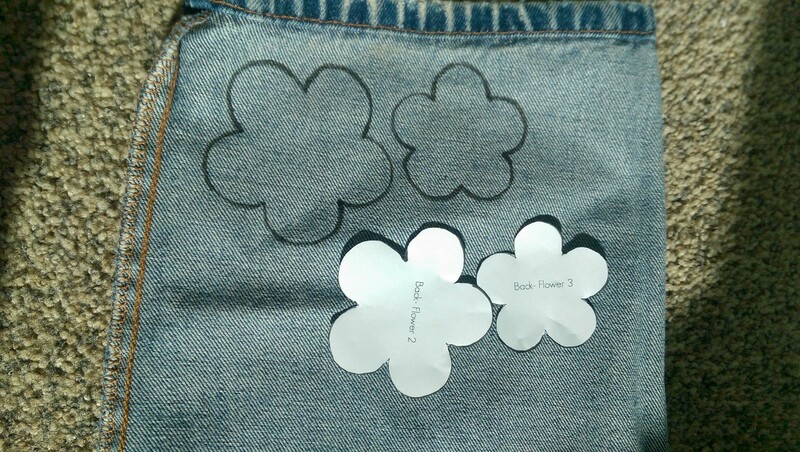 Once the sewing was complete, I trimmed the fabric to the actual shape of the tag. For added effect, I frayed the flannel edges of one of my tags, and the other tag I snipped lots of tiny cuts along the whole fabric edge to create my own fringe. After doing a couple this way, I got lazy and just ended up gluing the two pieces of cardboard together, skipping the flannel. I think that I prefer this simpler look, actually, and it makes tag making so much easier and faster. Once the tag layers were secured, I used my hole punch at the top. Of course I could have hand-written the names on these, but instead I went to my computer and found some fun, bold fonts which I printed in large sizes and glued on my tags. I used white paper, but colored or lightly patterned paper would be fun, too. Glitter, stickers, and other embellishments would spiff these up even more. Really, the sky’s the limit on what you could do with these. You can have all of your tags exactly the same, with only the names different, or you can color code for each child/recipient, or you can make each tag totally different. You might think that, with the rush and fun and craziness of Christmas morning unwrapping that these tags will just get tossed in with the other trash. Maybe…maybe not. These gift tags are actually very study and feel substantial in your hands. I don’t think that they will easily get mixed up with tossed gift wrap and bows. I’m going to tell my children to save them so I can use them next year…and the year after that…and the year after that, etc., etc. .
What started out as trash will be avoiding the trashcan for years to come. That’s the plan. Now, I just need to invade my recycling bin again to make a couple dozen more tags. So, do you have any empty cereal, crackers, or other thin cardboard boxes in your trash right now? I think it’s time to rescue them! Got an extra 2 minutes? It’s time for some lightning speed DIY! I added the frame in this pic as a clue to my “out of the box” idea. Are you thinking what I’m thinking? Of course you are, you smartie! This tank was a child’s size that I got at my local thrift store in one of those “as much as you can shove in a bag for $5” sales. I love those. I can shove a LOT in a bag. 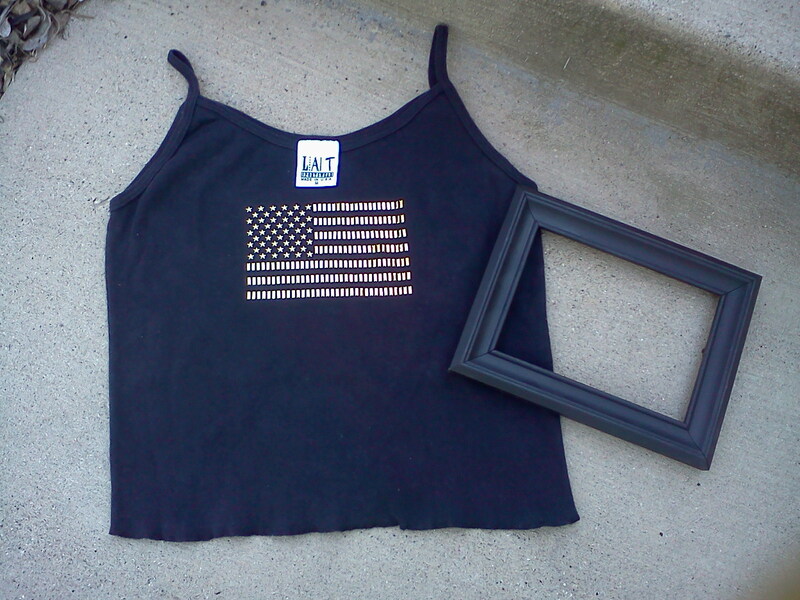 I have seen similar tank tops in my days of perusing thrift stores and garage sales. My guess is that if you frequent these cheapo shopping venues, you are sure to run across frame-worthy art, as well. You will notice that my frame in the above pic is black. I just applied a couple of coats of off-white paint and scraped off bits when it was still a bit damp to reveal the black beneath. FYI: I am not going to count that in my 2 minute (see my title) time frame. My blog, my rules! My thought is that you may already have a frame that you love that you don’t need to paint. 2 minutes: Ready? Begin! …then stick it in the frame. Voila! 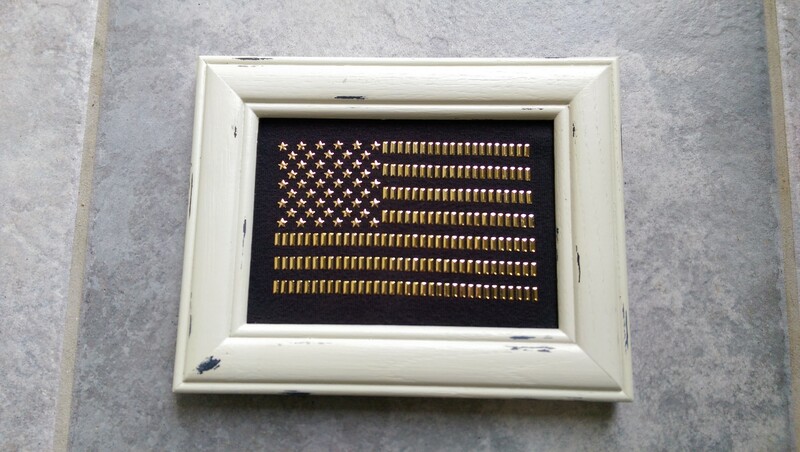 Makes me feel patriotic, just looking at it! So, what are YOU going to frame as art? Thanks, to Brenna from Life After Laundry for picking this project as her favorite for Tips & Tricks week 10! Another big “Thanks!” goes to Nemcsok Farms and Witty Hoots for picking this project/post as a Frugal Family Linky favorite! At this very moment, do you have any jeans in your home that really should be in the trash? 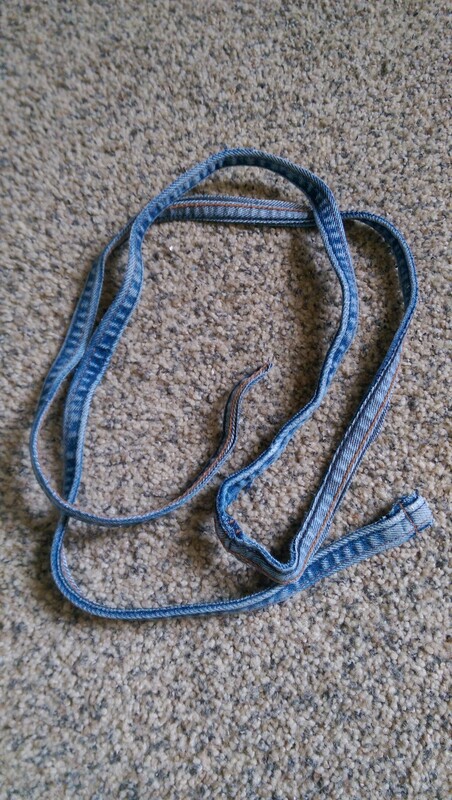 I’m talking holey, stained, terribly out of style jeans that you know will never be worn again? 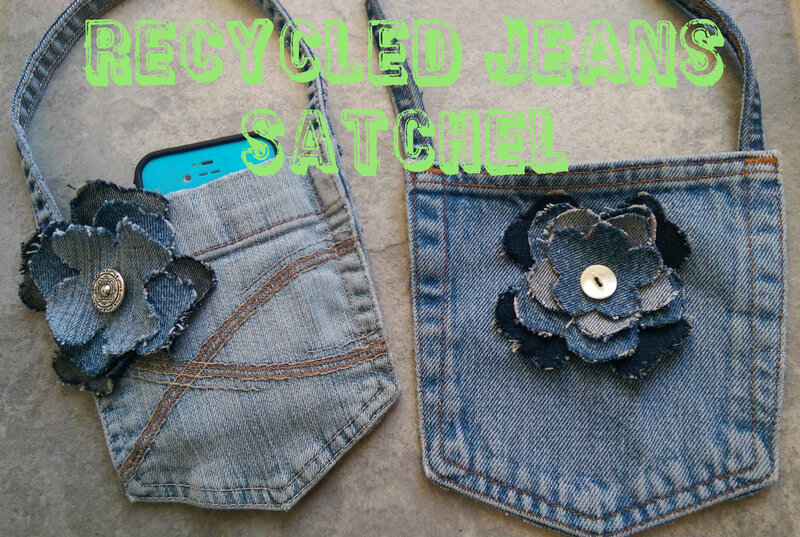 I recently came across some jeans destined for landfill and I decided to check out Pinterest (of course!) to see what I could make with them instead. 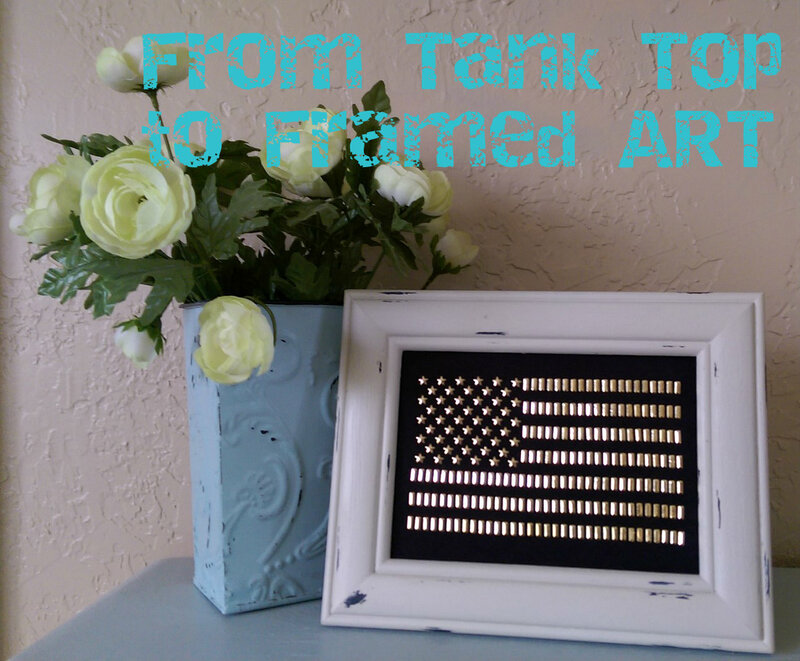 Although I found some really fun projects, I didn’t see anything that screamed, “Make me!”. Not knowing what I was going to make, I started cutting and this is what I ended up with. I kind of love them! 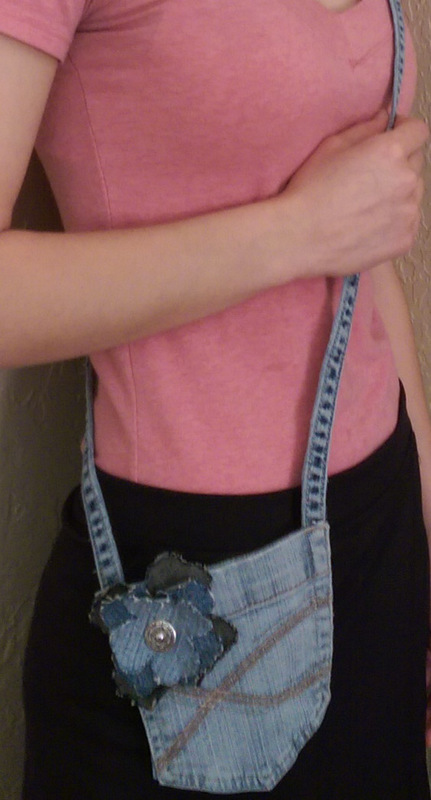 Think of it as a satchel for putting your phone, lipstick, or whatever you need, in. Do you ever find yourself wearing an outfit that doesn’t have pockets? Maybe a dress, skirt, yoga pants? It’s kind of a pain. 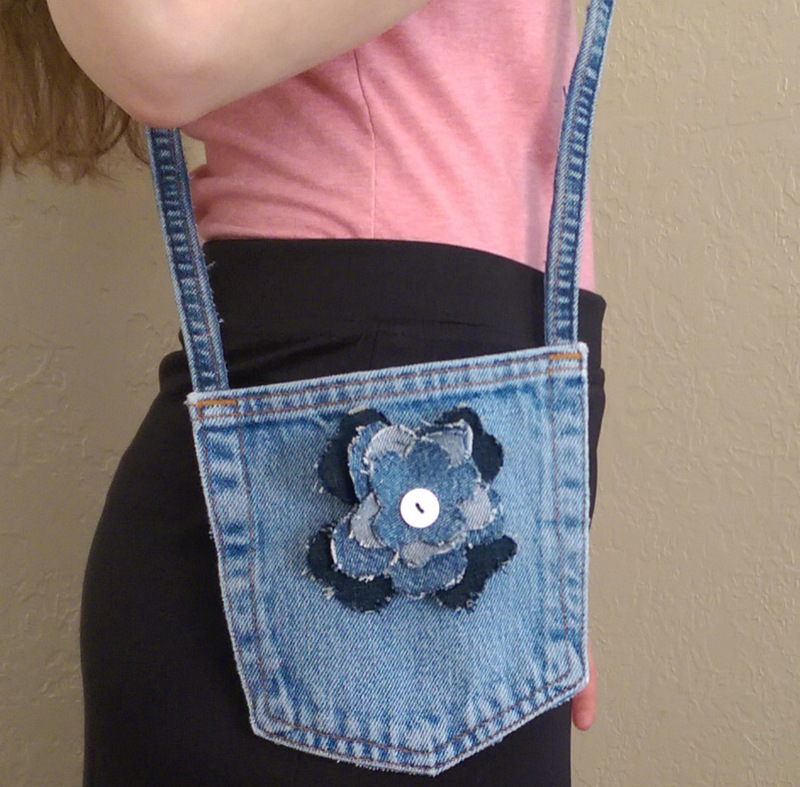 Make one of these simple satchels and you won’t need to carry your stuff in your hands or have a full on purse when you really don’t need it. Ready? Set? Go! 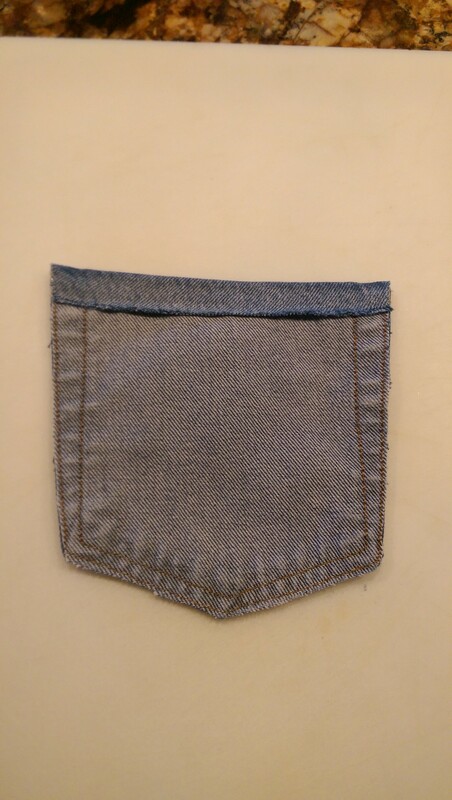 First step, cut off the pockets. Easy! 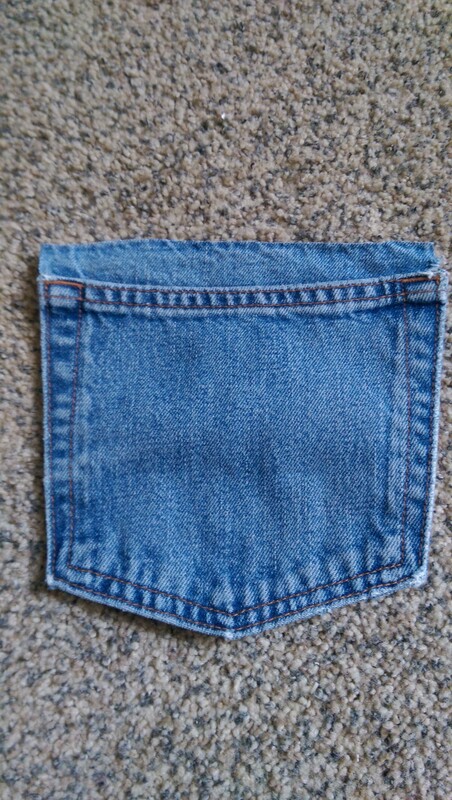 Cut only the bottom layer (not the finished pocket edges) and leave a bit of fabric on the top. Flip it over and hot glue the top edge down so you can have a finished-looking front. Back doesn’t look too bad, either. then cut out the fabric. Might as well cut out two layers at a time, right? 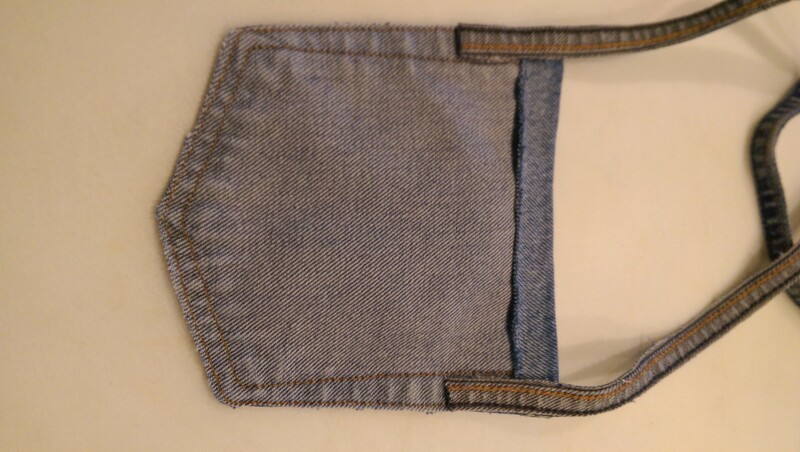 I wanted the denim to looked a bit frayed, so I just scraped the fabric edges with my fingernail to get that effect. To assemble the flower, grab some thread, a needle and a button and sew the button through all of the layers…or…hot glue each layer and add the button to the top. 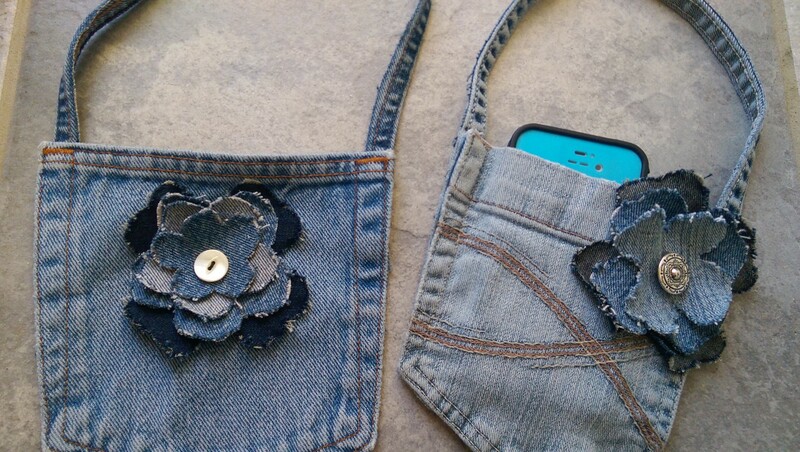 Then just hot glue the flower to the pocket. Play around with positioning before gluing. For the strap, cut out the inseam starting up one leg and once you reach the crotch, going down the other leg, then back up and down the other side. 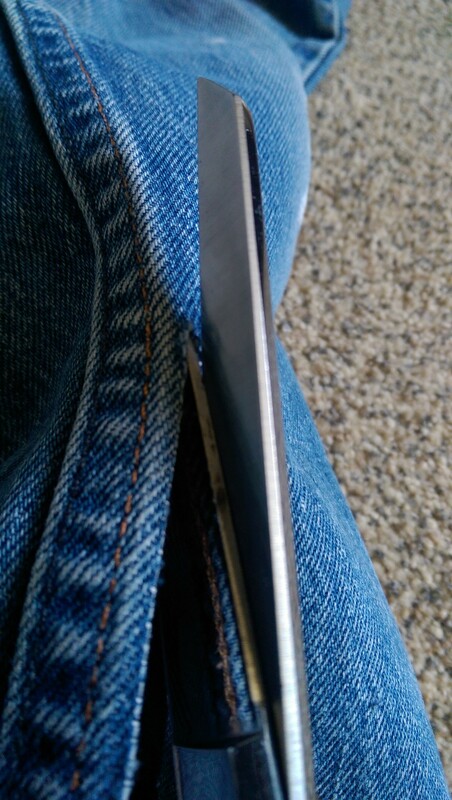 Most, if not all jeans have double stitching for the inseam so just cut near the finished edges on each side of the stitching. Easy-peasy! I have been asked to be in charge of crafts for a young women’s camp this summer and this is definitely one that we will make. My goal is to have the girls create items that are useful, not something to shove in the back of a drawer once they get home. I think that they will like them.